The Supermarker plier seal can emboss a perfect impression onto standard paper, up to 45mm diameter or 45mm x 22mm rectangular. Strong & durable, the Supermarker will emboss a perfect Company seal impression or logo. It is a well designed product that fits easily into your pocket or briefcase. For those on the move, the Supermarker has available; an optional travel case and desk stand. The Supermarker can also emboss smaller impressions onto heavier weights of paper. Please email your requirements. 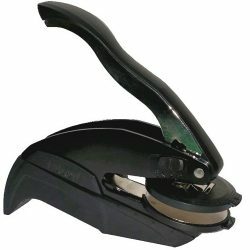 All hand plier company seal embossers fold flat for storage. Normal delivery time is 1 to 2 days. The standard hand plier, company seal embosser, can have up to 36 letters & spaces around the circumference, with outer and inner rings around the lettering. It is suitable for embossing a 35mm diameter seal, onto paper up to 90gsm. It comes with a neat plastic wallet for easy storage. Super Marker plier seal can have up to 46 letters & spaces. It is supplied in a cardboard box or with the optional travel case and desk stand. It is suitable for embossing a 41mm diameter seal, onto paper up to 100gsm.